Sausages, or “snags” as they’re more commonly known in Australia, are a BBQ staple that you can make as simple or gourmet as you’d like. Serve them as pigs in a blanket, slice them and use in a stew, or serve them with some sauteed tomatoes with rosemary – you can do so much with them. But there’s one problem. Like many other foods over here, Ev and I discovered that they didn’t taste quite right. Unless you go to the farmers markets and buy English style sausages for jacked up prices, you can only have sweetened style sausages from the supermarkets. Add in the usual trials of finding fructose friendly sausages and last winter we decided to make them ourselves. You will need to set a few hours aside for this task and we found that actually stuffing the sausages worked best with teamwork but the results are so worth it. I apologise for the lack of “how to” photos, our hands were both too grubby and full to use the camera. I’ll attach a link to a YouTube video to help explain it, instead. If you don’t have a meat grinder/sausage stuffer, you will need one for this. We have attachments for our KitchenAid but you can buy standalone machines. It follows that these instructions will be directed towards KitchenAids but they should work well for any grinder. At any rate, the recipe won’t need to change. We found that cutting the pork shoulder into strips sped up the initial grinding phase. If you want to cut out half the time, you could use pre-minced meat but it will be more expensive and you will need to be careful of any additives. Hog casings can be bought from most butchers, although in the US it’s a bit harder to find a good local butcher because they all seem to be attached to giant mega-supermarkets. We are lucky to have a decent butcher around the corner. If they are frozen, make sure you soak them in salted, luke warm water until they are properly thawed, then rinse them off. You can of course play around with the spices – try some paprika or cayenne. Yum. 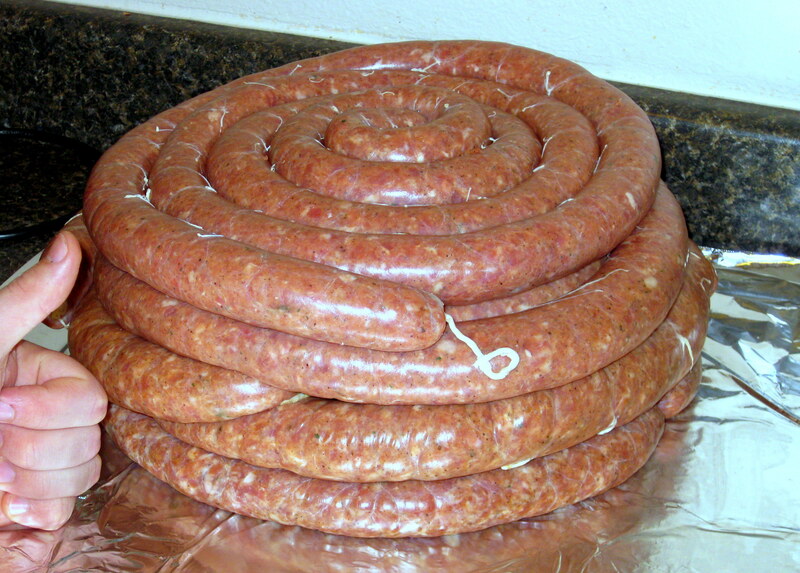 Mince the pork meat strips in your grinder, sending it through the grill with the larger holes. This is a very monotonous process, sorry. Play some music, or do it with a friend so you can keep each other company. Next, swap the large hole grill for the smaller hole grill – if you have one – and repeat the grinding process to make the mince even finer. Stage 1 complete. Mix the rest of the ingredients, except for the hog casings, thoroughly through all the newly minced pork. Remove any of the grills from the grinding attachment before you insert the stuffing attachment. Wash your hands and set up the sausage stuffing piece with the grinding attachment – or follow the instructions of whatever device you have. Place the hog casings onto the stuffing pipe, pushing them to the back and leaving a 10 cm length hanging off the edge. In the top basin/tub of the grinder, one person needs to use the paddle to squash the mince/spice mixture through the hole and into the grinder while the other person handles the casings and the stuffing process. Once you have run a small amount of the mince through the device, stop it and tie a knot in the extra, as close to the mince/attachment as possible. This step was to make sure you didn’t have a giant air bubble in the end of the sausage, as you would if you had tied the knot before running any mince through the machine. Keep the machine running at a medium speed, steadily pushing the sausage mixture through the grinder at an even rate, ensuring that you don’t have any air bubbles. Don’t rush at first, it takes a little while to get used to the process and you don’t want to tear the casings while you’re at it. Once you near the end of the casing, knot it off and load the next onto the machine. This video, Italian Sausage – How To Stuff Sausage, will run you through the basics in such a way that you can see what is happening. It is a huge help to be able to imagine what you’re supposed to do before you do it. Now you have a single, very long sausage. Have a good laugh at what it looks like and then begin to twist it into individual snags. Just decide how long you want each of the sausages to be and then place a hand on either side of the mark and twist thoroughly. The twist should stay in place. 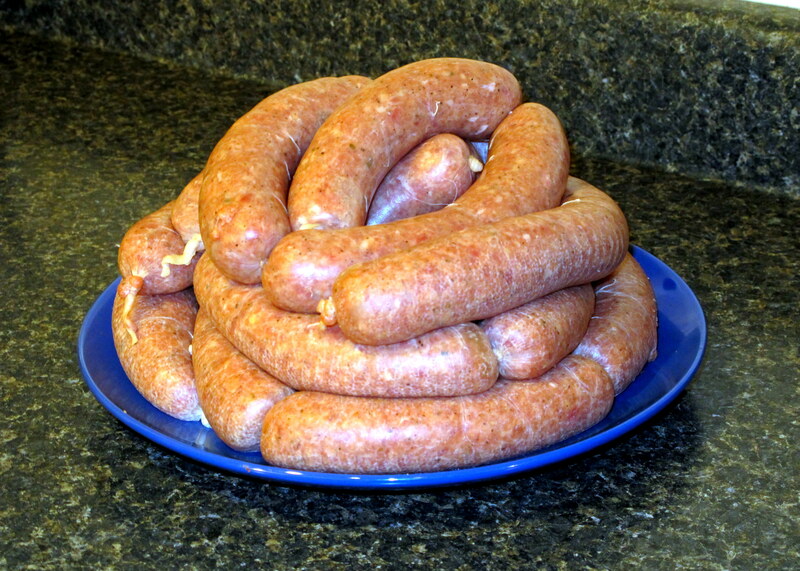 Once you have twisted the length onto individual snags, we like to portion them into more reasonable sized numbers that we are likely to cook in one go – three sausages means one for me and two for Ev. 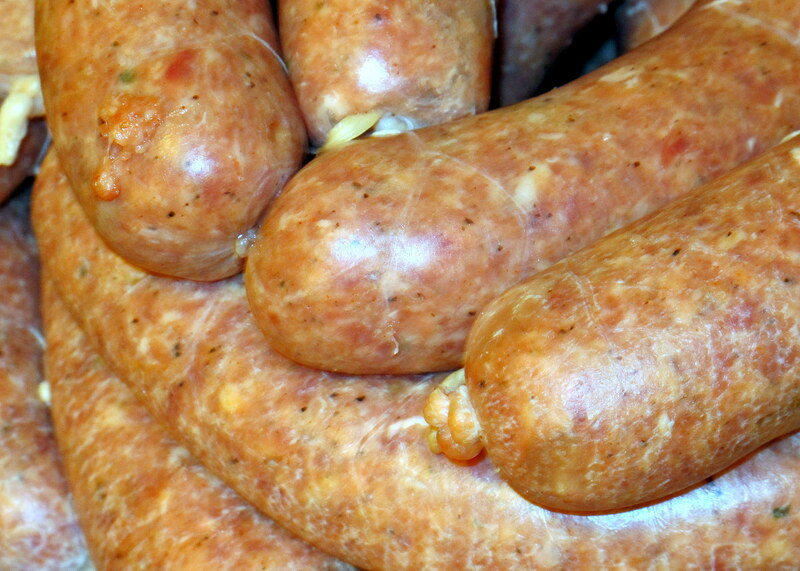 We then bag and freeze them, and have a stash of tasty snags in the freezer when the need for comfort food calls us. Once thawed, we like to stab a few holes in them and then boil them for 10 minutes to pre-cook them before frying until the outside is browned/crisped up a little. Make a batch of these and be the hero at the next backyard barbie that you go to. This entry was posted in Australian Cuisine, Carnivore, Carnivore Entrees or Sides, Dinner / Mains, Entrees, Appetisers and Sides, Lunch and tagged Aussie, Australia, banger, bangers, barbeque, barbie, bbq, comfort, comfort food, dinner, entree, FODMAPS, food, fructose friendly, fructose malabsorption, gluten free, home-cooked, homemade, low fructose, low sugar, sausage, snag, snags, summer, winter. Bookmark the permalink. Do you get your hog casings from Golden Steer? We did, this time last year. They were the only place around that we could get them from. Supermarket butchers are hopeless. Awesome, you’ve totally inspired me to try this. Just need a grinder, a sausage stuffer and a deep freeze to store all the sausages. Yes, definitely. I’m want to make sure Mr C will eat them before I made dozens. I’ll need a deep freezer first though! I’m sure “Mr. Firehouse” will oblige if his mini-me doesn’t like them. And the recipe can also be scales back. I definitely have to try this. Finding tolerable sausages is practically impossible!!! I know, and these freeze for ages… If they last that long. We ended up giving some of ours away to friends. You can’t beat homemade. Good luck!